How does one successfully adapt to a changing marketplace for online gaming? By reacting and applying new structures and features to keep a steady stream of users. React casino has dominated the online playfield by releasing new, relevant content at a progressive clip. Their infrastructure supports players of all different backgrounds, keeping classic titles relevant and adding to the change of the times with new content draws. 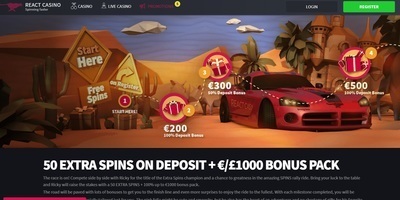 Their development team adds an impressive live casino to meet with the regular content we have come to know and love. Below is a detailed look at this newly minted casino and a list of some of the expectations that can be met upon visiting. The casino was developed in early 2018. The casino holds three separate licenses from the top authorities on the marketplace. The Malta Gaming Authority, the UK Gambling Commission and the governing body of Curacao all work in trio to provide a secure and stable environment of play for all users. The content development team pulls from the top providers, ensuring the library is readily stocked with content to meet the latest trends and machine developments. The stance of the casino is to create an easy-to-access platform where the user can reach their destination without having to comb through unnecessary content. Easy tab allocation meets an excellent graphic design, keeping visual appeal and ease of usage, high. The casino plays owner to nearly 700 titles in their slots department. This slot extension includes classic 3-reel and 5-reel draws, with variants that add bonus games and free spin features. Additional buzz is created with the development of virtual and 3D titles. These progressive play options follow storylines that come down from some of the top multimedia sources in film, television, and other such depictions. Progressive jackpots are often tied to the top played machines on the site, adding to the life changing payouts a user can claim. The live casino element creates one of the largest libraries on the market. Currently, the casino boasts 125 titles within this area of the casino. The live dealer selection comes from hosts with many years of experience within the industry. Their expertise helps create an immersive experience that ties the user to the game. Each game adds to the social aspect, allowing players to converse with other users and their live hosts. Mobile development is also carried via application. This app plays host to over 400 titles from the slots department, adding a carryover ratio that includes most of the titles located on the regular platform. The user can find this application for free download in most application stores. Device compatibility will vary, so check with your provider’s support staff to ensure smooth transition to this application. React casino offers a welcome packet for new users. This packet contains 3 offers that total to $1,000 in free playing cash. This money is credited when the user meets the 100% match deposit requirements. This amount carries a 30x playthrough amount, which is tame compared to other promotional gigs offered across the online marketplace. Introduction to new platforms also gains the user the opportunity to claim free cash. Cash-back offers are carried on most of the live casino games, affording the user funding when the ball isn’t slotting their way, or the cards being dealt are unfavorable. Weekend offers are created to keep the buzz surrounding some of the best social games on the site. Holiday and seasonal promotions are in constant influx, but most carry a limited-time-off status. Check back with the promotional page often to ensure they don’t expire. Full Terms & Cond apply! Visit official website for full information!